It actually started with crying about how sore her wiggly tooth was. Then the tissue paper wad was soaked with bright red and my little K was not loving it. She walked into my room and said, "mom, I'm shaky." I looked at her and realized she was pale. I don't either honey. Do you feel okay? "I think I want to throw up." Okay, do it in the bathroom! We raced in and she sat down on the floor. I immediately remembered when my son passed out. K was mesmorized and frightened by the bloody tissue and I thought she is going to faint. I grabbed it and flushed it down and told her to relax. The color was coming back to her face and with a couple of tugs on her own, K had the tooth in her hand and her gummy smile was such a relief! "Let's get donuts to celebrate!" Well thank goodness for the change in her behavior. I hope this fear doesn't pop up every time, because two more of her teeth are loose. I'm thinking pureed ham for her this Sunday. Sing along with me..."All I want for Easter is my 2 Front Teeth!" Awww, poor K! I'm glad you realized it before it was too late. Sounds like she'll need a little caretaking there. Give her a hug from us! my niece wiggled her tooth for me and I got a little sick. But I remember wiggling mine when I was little and loving it. Be strong! awe - "mom Im shaky"
I don't like the sight of other people's blood, but mine - I am fine. Loose teeth is always a traumatic event at our house. My kiddos don't like getting them pulled. They're happy when they're out, but the process getting there is crazy! My children were always traumatized about losing teeth. 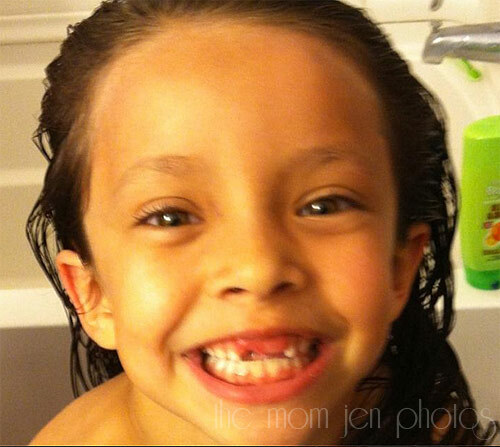 One time my son accidentally hit my daughter and her loose tooth fell out, so that was an easy one for us! Awwwww. I like the way you write! I can see your worry for your kids. This too shall pass! My son is 5 1/2, I am still praying his teeth wait a little bit longer before falling out. His friends are already losing their teeth, but his aren't loose yet. What a nice gummy smile! My oldest, who turns 6 this month, has just lost her bottom front teeth so far. Fortunately she's had a pretty easy time of it, with no blood to speak of. Thank heaven! I'd have to peel her off the ceiling she's so spooked by blood! What a cutie! It always bothered me every time I had to take my son to the doctor and I knew it was going to hurt, but he was always a trooper! Hope the tooth fairy is good to her. I remember when my daughters first tooth came out and she freaked out when she saw the blood. I tried to cheer her up by reminding her the Tooth Fairy was going to visit her tonight. September 18, 2013 at 11:33 PM This comment has been removed by the author. I can not stand the sight of blood or needles. It really makes me queasy. Your child is so cute and I remember my son with his teeth like this missing. They are so cute when the teeth fall out. I can totally relate to this story, poor girl! I remember when my oldest was 5 she was running in the yard and she had her knee up to high and tore the skin from her gums. Well blood gushed from that little flap. My youngest was 3 she came in screaming sissy is going to die. I freaked out because there was blood everywhere, after I saw what it was I calmed my little one down and good thing because that girl looked like she was about to have a nervous breakdown. My son is also pretty scared of needles. Poor kid. Poor kids, every kid is scared of needles I think. I remember my sister being like this and once her tooth came out, she would faint. Guess all kids are different. What a cutie and an awesome smile that brings back so many memories to me. The days of loose teeth and crying and the tooth fairy. The first one is the worse. But getting faint at the sight of blood must be scary too.